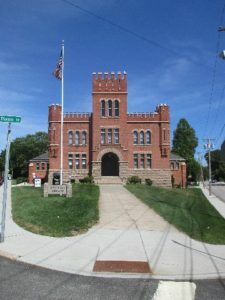 The Westerly Armory is an historic National Guard armory building located on Railroad Avenue, west of downtown Westerly, Rhode Island. The building was erected in 1901 after the armory on Main Street was destroyed and is one of 18 historic armories in the state of Rhode Island. Now, the Armory is home to the People’s Museum, which holds a wide variety of both community and military artifacts. The Armory’s hall (drill hall) can be rented and is available for hosting events such as weddings, anniversaries, awards ceremonies, book and antiques shows, home shows, and the like. Check out the pictures of the drill hall and see if it is a good fit for your event.